Marchronis’ words represented the feelings of everyone present and even Shyemul, who would usually flare up at such remark, apparently couldn’t find any fault with them. Only Jahangil got worked up and said “They will be scattered by my kicks!”, but the others stayed silent while uniformly showing bitter expressions. Understanding that Souma hasn’t given into despair, Marchronis let out a sigh and tried to calm his emotions. Marchronis deliberately used a sharp manner of speech, which implied that he was remonstrating Souma’s hasty act. Guessing Marchronis’ intention, Souma returned a wry smile. Taking into account the hypothesized difference in combat power, they will definitely lose if they fight normally. If they want to win despite that, they have to take a dangerous bet. Even Marchronis can understand as much. However, Marchronis thinks. Even if the punitive force were to be careless, for argument’s sake, only that won’t be enough. Moreover, on top of that they have to obtain victory with their own hands. Souma points at a place on the map. The map showed a river, which streams from the northern mountains to the south after passing between Bolnis and Luoma, and a bridge that spanned over said river at the place he pointed at. What Souma thought of first was to wash away the punitive force with a muddy stream after making a dam that would be built upstream burst while matching the time with the punitive force’s river crossing. It’s a move often used in manga and light novels about military history, but even the dwarves, who possess a high engineering skill, would probably be hard pressed to build a dam that can accumulate enough water to wash away the enemy troops in a short time. If that’s the case, I will confirm whether I can realize the other move I came up with. Marchronis answered while digging up the bridge’s structure from within his memories. Among the bridges of this era there are many such simple constructions that only laid planks or logs across rivers. It bases on the preamble that the bridge will be dropped to hold back an invasion when getting attacked by an enemy. For Souma that became increasingly convenient. Adding the information he learned just now to the strategic plan he had devised, bustling simulations repeatedly played back within Souma’s head. What will the other side do against our actions? What are disadvantages for our enemy? When everyone started to get impatient due to him having sunken into a deep brooding, Souma finally lifted his face. Within the gazes gathering on him and asking him to explain what he means by that, Souma asked Marchronis a question instead of addressing those inquiring looks. Shyemul got angry due to that. For the zoan a battle is a place to demonstrate their own bravery. Something like assaulting those who don’t possess any combat strength is nothing else but a disgrace. Just the fact that they are regarded like that is an unbearable humiliation for Shyemul who has a high pride to the extent of holding the nickname of 《Noble Fang》. Souma threw a lifeline to Marchronis who is baffled due to Shyemul’s menacing look. She pretends to act really reluctant, but her desperately resisting forming a smile gave it away immediately. Unable to comprehend the meaning of Souma’s words, all of them had questioning looks. Souma points at the picture of the bridge that was placed on the river which was drawn in the upper half of the map. Souma nodded at Marchronis’ conclusion. 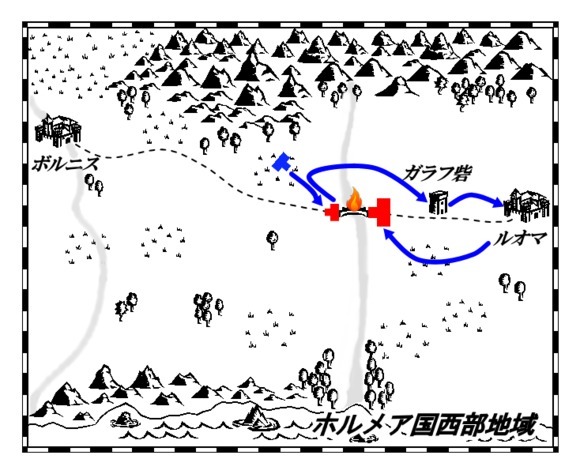 No sooner than sliding his finger towards Bolnis’s side at the upper part of the map, Souma moves it towards the river’s upper reaches as if drawing a U turn. At that point Zurgu raised a question. If it happens as Zurgu says, the punitive force will invade the city of Bolnis with the main force of the zoan not present. However, there was a voice immediately denying that. “That’s very unlikely.” Marchronis declared. It’s an age where wagons and such end up stranded just due to getting stuck in the road’s mud. It’s difficult to imagine that the punitive force will make those wagons forcibly cross through the river even if the depth is only at the level of reaching up to the knees. Besides, as food preservation techniques haven’t been developed either, they are sure to avoid something like exposing their precious provisions to the river water. Souma, who obtained Marchronis’ certification, continued while feeling relieved in his mind. Garam is surprised after being told that they will only show themselves even though he was certain that they would attack the city in the rear. With that reply, Garama comprehended. Once Souma lets his gaze wander after saying so, Marchronis shows his agreement. Having understood the strategy, Garam faces Zurgu after saying that. Once he does, Zurgu bares his fangs and grins broadly. Souma looks hopefully at the two great leaders of the zoan who were full of motivation. However, right after that, Souma dons a serious expression. Souma turned to the back and called out to Shahata who is standing at a slightly distant place without having joined the sitting circle. Souma slightly lifts the corners of his mouth in a meaningful way towards all those present who are puzzled why the name of the human peddler has come out at this point. The king of Holmea, Warius Sadoma Holmeanis, overlooked the orderly ranks of the royal army facing his way while sitting on an impromptu throne on a formal podest that had been set up in an open field in the royal capital’s outskirts. King Warius, who will reach the respectable age of forty this year, is an impressively skinny man with goggling eyes and sunken cheeks. Because he was continuously combing down his Fu Manchu moustache, which he had grown in favor of gaining dignity, with his fingers since a while ago, it emphasized his nervous expression all the more. Darius, who went up the stairs of the formal podest in front of King Warius, puts down the helmet he wore under his arm, kneels down on one knee and bows his head. Standing up from his temporary throne, King Warius received a treasured sword from a chamberlain and immediately disposed the sword of its scabbard. King Warius’ hand that holds the sword, which shines glaringly after being struck by the sunlight, trembled slightly as he bears the sword’s weight, but of course there’s no one who would point that out. King Warius announces with a slightly shrill voice and places the treasured sword, which was put back into its scabbard, on to of Darius’ hands which he held out in order to receive it reverently while bowing his head. Darius affixed the treasured sword to his waist, stood up while still bowing and backed off several steps in that state. After that he put on his helmet and turned around to the soldiers, who are watching the ceremony of departure, while making his mantle flutter with a sound. And, while letting the violet tuft of his helmet, that signifies him being the general, trail in the wind, Darius unsheathed the treasured sword at his waist and thrust it towards the sky. Seeing that action, the soldiers thrust out their spears and swords in the same manner and raise fervent cheers. The fervent cheers chanted by several thousand people all at once made the atmosphere vibrate with a rattling. Darius, who sensed the soldiers’ high morale, descended the formal podest’s stairs after nodding once in satisfaction, and boarded the chariot that had been parked there. It’s only natural, but although it might be called tank*, it’s not an armored combat vehicle running on caterpillars and possessing a rotating gun turret like the ones existing in the modern world. If you speak of chariots in this world, they are wooden boxes with two wheels, which are pulled by horses or other mounts. The wooden box, which carries people, has a slightly tall part at its front and its rear has been left open for boarding. It can carry two people, a driver and a soldier who stand shoulder-by-shoulder, and it’s pulled by two kiryu or horses. If it enters battle, the driver takes the reins while protecting the soldier with a small, round shield, whereas the soldier fights by using a bow or throwing spears. There are also four-wheeled chariots that can carry four people. These have a higher offensive ability than the two-wheeled versions because the number of boarding soldiers increases by one in exchange for a loss in maneuverability. And the chariot boarded by Darius is a big version with six wheels that was pulled by an astounding six horses. A chair for the commander has been installed in the centre of the chariot that was covered by a roof to protect the passengers against arrows. A great drum to relay commands had been placed beyond a partitioning screen in the back of that chair. The boarding passengers are in total five: the commander and the driver, one soldier on the left and right side of the chariot each, and moreover one person to hit the drum. Once it has reached this point, it’s probably better to call it a mobile command post rather than a chariot. Hearing Darius’ order, the drummer starts to hit the drums as powerfully as he can. Accompanied by the drum sounds and a little shock, the chariot with Darius on it started to move. Following that, two-wheeled chariots boarded by the regimental commanders, who wore helmets with green tufts that indicated their military rank, and the infantry regiments, which moved in two columns, begin to march. The nobles, who came to see off the punitive force on both sides of the marching route, cheered while hoisting many flags that had big crests drawn on them in order represent the respective noble household. His personal guard, who was nearby, calmed down Darius, who spat that out due to the uproar, with a bitter smile. This time there were many noble youngsters, for whom this will become their first battle, included among the commissioned officers of the army led by Darius. That’s because the nobles had their children, who didn’t have the chance to experience their first battle so far, join the punitive force together in a group. As even the battle with their bitter enemy Romania stayed in a lull most recently, there weren’t any major battles to be fought. What suddenly came up in this situation is this rebel subjugation in Bolnis. According to what they heard, the rebels consist of a small force that doesn’t exceed a thousand by much. Moreover the one heading out to subjugate them is General Darius who is highly acclaimed as great commander. No matter where the nobles looked, they couldn’t find any factors that would point towards a defeat. For the parents, who wish to adorn the first campaign of their sons with a magnificent victory, there would be no other such convenient battle. As result of that, the army heading out to subjugate the rebels of Bolnis had reached a scale that exceeded the initially planned estimate with a total number of a nominal 10,000 troops. The real number swelled up to a large army corps of 7,000 troops. Even Darius himself considered a rebel subjugation as just the right opportunity for the young commissioned officers to gain experience in combat, but having said that, he can feel that they are too light hearted due to their numerical superiority. Sensing a need to slightly pressure the young chicks, Darius called the commissioned officers, who stayed at the sides of his chariot, together. The soldiers were completely equipped because of the troop dispatch regulations. Moreover, because each of the soldiers carried provisions and water bags for several days on top of that, the total gross weight of what they carried was quite a burden. Just walking with this caused them to quickly accumulate lots of fatigue. Hence, the soldiers would change into lightweight equipment as long as they don’t have to fear an imminent enemy contact, and depending on the situation, they would place all their gear on the wagons. Reducing the soldiers’ burden is a common marching practice. This suggestion of a commissioned officer was something very reasonable in this area that was still far away from the city of Bolnis where the rebels are. However, Darius stares at this commissioned officer with a glare. They will link up into a tight formation while fully armored and advance as they search the area with scouts. That’s the common method of the royal army once they don’t know when they might encounter enemy forces. However, in that case the soldiers will end up wasted before the battle due to fatigue. Putting aside doing that close to the city of Bolnis, it’s not something you would do in a situation where the army hasn’t really left the area of the capital yet. Upon the order of Darius, which he hadn’t even expected, the commissioned officer let a reply leak that showed his feelings, which might also be interpreted as disrespect towards the general. The commissioned officer immediately notices his own error and straightens up his back in panic. Darius smiles wryly at the commissioned officer who cannot hide his confusion despite answering like that. Darius twists his mouth, that was hidden by a full beard, into a broad grin. At that moment a cavalryman, who ought to be close to the head of the ranks, approached Darius’ chariot with his horse. Due to the words of the cavalryman, who holds out a beautifully folded letter, Darius is reminded of the woman in male clothing who serves her armless master. Once he opens the letter which he received through his personal guard, who is riding the chariot next to him, only a concise sentence was written in Tutu’s handwriting, which Darius recognizes. Due to that phrase, Darius recalls the time when he passionately debated the strongest army he dreams of while drinking booze together with his fellow young commissioned officers, at the time when he was still a greenhorn. However, his indulging in that nostalgia only lasted for a mere moment. Saying that, Darius audibly tore up the letter. Souma will try to repel the punitive force with a strategy of striking once and then withdrawing while making use of the river. It seemed as if everything is proceeding as planned. However, at that time there’s a slight feeling of discomfort that hit Souma. What Souma felt was a chill he couldn’t identify. Chariots are used preferably over cavalry in this world. As of yet things like horse tacks haven’t been developed in this world. For that reason, an advanced skill is necessary to mount a horse. Moreover, there are kiryu that have spread instead of valuable horses, but those are animals that are even more difficult to handle as mounts. Because kiryu are running on two legs, just like the epic Cho●bo of a certain RPG, the impact and swaying will become far more intense than when riding a horse. On top of that, since the part where one can sit on is far smaller than with horses, it’s difficult for the rider to stabilize their body. Hence the rider makes sure to strongly hold onto the torso of the kiryu with both legs when sprinting with it. They will end up being thrown off if they don’t stabilize their bodies by firmly grasping the bump that sticks out at the front of the saddle with one hand (depending on the situation, with two hands). Therefore, shooting arrows or swinging one’s sword or spear while riding a kiryu, as it often happens in movies and manga, is almost impossible. Compared to that, a chariot can be boarded easily by anyone, and on top of that it’s possible to attack through soldiers while moving at high speed. There’s also the advantage that the burden on the kiryu or horses is low. For those reasons chariots are used more often than cavalry. However, that doesn’t mean that cavalry won’t be put to use at all. The branches of an army, which require quick actions such as messengers, are mostly composed of cavalry. Just as mentioned above, kiryu are far more difficult to manage than horses. Also, since they are weak to cold and inferior in speed, they are regarded as one rank lower than horses. However, there’s a single point in which the kiryu are overwhelmingly superior compared to horses. That’s the fact of the kiryu being omnivorous. One has to prepare large amounts of fodder when using war horses for things like cavalry, chariots or transport. Because they are forced to transport that fodder, even more warhorses are necessary… a fact like this exists as well. But, since the kiryu and niryu are omnivorous, they can be fed with the same provisions as human soldiers. Given that especially meat excels much more in energy efficiency than fodder, the amount of given feed becomes far less than that of a horse’s fodder. That turning into a reduction of fodder that has to be transported also results in the labor required for that transport to become less. For poor commissioned officers that cannot buy a horse, the relative affordability of the kiryu’s price and breeding costs carry a huge appeal, even if they are difficult to manage.